A petition has been organised by Warrington and Berwick St residents now it has become clear City Council staff want increasing amounts of traffic to go down their street to three-laned Barbadoes and Madras Sts, creating clearways, reducing parking and possibly creating more problems than it is meant to solve. Drainage is being fixed in some parts of St Albans while new problems are coming to the surface in others. The butterfly colony in Abberley Park is under threat from rats. Sixteen pages jammed full of news and views about St Albans. The printed version is being delivered to St Albans letterboxes over the next week by our band of volunteers. 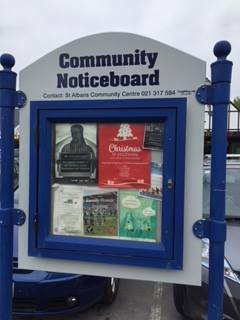 Also available in selected Edgeware Village shops. You can also download a digital copy – click on the image to the right. 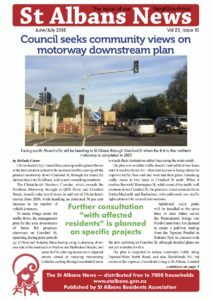 How the new motorway will affect streets in St Albans downstream of Innes Rd is the main focus in the June/July issue of St Albans News – the city council wants feedback. 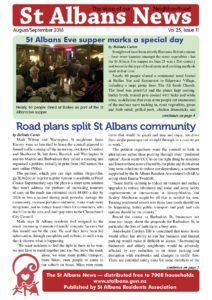 Lots has been going on in St Albans these past two months and we tried to fit most of it in 16 pages. Find out about a special event being held on June 21, the eve of St Albans Day (which also happens to be the southern hemisphere’s winter solstice) and lots more besides.The printed version is being delivered to St Albans letterboxes over the next week by our band of volunteers. Also available in selected Edgeware Village shops. Alternatively, download a digital copy by clicking on the image to the left. It’s five years since the Edgeware Village Master Plan for the recovery of St Albans after the quakes was created but little has been done to implement it. Then out of the blue the Christchurch City Council decides that stopping northbound traffic on Colombo St from entering Edgeware Rd and on to Cranford St might be a good idea. 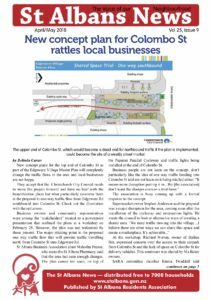 Consultation has started on this new concept and business owners are none to happy about the proposal. All this and lots more in the April/May issue of St Albans News, being delivered to St Albans letterboxes over the next week by our band of volunteers. You can also download a digital copy by clicking on the image to the right. 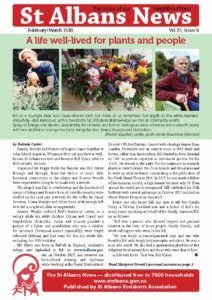 The February/March issue of St Albans News has a botanical theme to it. 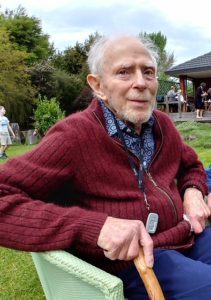 We mark the passing of a well-known and loved local identity Bill Sykes, one of the people behind Packe St Park’s foundation and the centre pages are given over to a photo feature. The world seems to be heading towards roads full of electric vehicles so we profile a couple of locals who have ditched petrol for electric vehicles. All this and more in the February/March issue, now available online by clicking on the image to the right (and, if you live in St Albans, will be delivered to your letterbox soon). Bill’s botanical roots started very early. He was born in the County of Suffolk in East Anglia and grew up in the village of Wyverstone. We have his mother Miriam to thank for the fact that we could understand him. Visiting all the participating businesses on the Biketoker Passport paid off for one family, with Mum winning a Bailies Voucher and her son winning a Tannery Voucher, which he graciously shared with his sister. 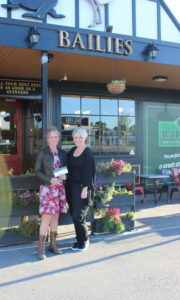 Marie Hudson pictured here receiving her voucher from Amy, the manager of Bailies Bar. 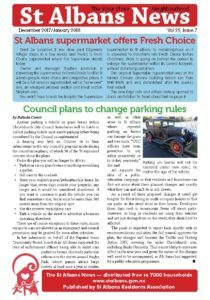 In the Christmas issue of St Albans News, we reveal that the supermarket is about to change its livery – from Supervalue to Fresh Choice and the city council is plotting some new rules about street parking. All this and more in the December/January issue is available online (and, if you live in St Albans, to your letterbox soon). Click on the image to the right. It looks like Duncan Webb has taken the Christchurch Central seat (of which St Albans is a large part) but the party vote at the preliminary count was close. We can only wait patiently while the parties negotiate to decide who will actually govern. 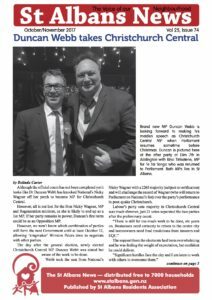 The elections, the community picnic in Abberley Park and the new buildings at St Albans School are among the items featured in the October/November issue, which you can download to read by clicking the image on the righthand side. According to statistics on the elections.org.nz website an estimated 79.32 per cent of voters in the Christchurch Central electorate that encompasses St Albans, have registered to vote as at September 17. The percentage is an estimate as the population figures are based on the 2013 census. Enrolment levels are highest amongst those aged 70+, with 95.1 per cent enrolled on the general roll for Christchurch Central. Those aged 35-70 also were highly likely to be enrolled (80%+) but numbers dropped down to a disappointing 53 per cent amongst 18-24 year olds. That age group contributed the largest number of enrolled voters in the Te Tai Tonga (or southern Maori) electorate living in Christchurch with 388 of the 1823 total voters from all age groups already signed up. Few places have been authorised to offer advanced voting and none of them is in St Albans. The closest place to vote early in the Christchurch Central electorate is at the Central Library in Peterborough St, which you can do between 9am and 6pm until Friday September 17. Voting cards are not needed (they just speed up the process for the election officials) and if you have not already enrolled can do so and vote at the same time. Advanced voting is proving popular with numbers voting early up on 2014. Many people who won’t be in their electorate on voting day (September 23) or who will be working while the polling booths are open, choose to vote early.